No matter what time of year you visit, North Georgia offers incredible scenery and a multitude of things to do. The Blue Ridge Mountains are the perfect backdrop for both relaxing retreats and heart-pumping adventures. Whatever your reason for visiting, you’ll be able to breathe in the fresh air and take in the unbelievable sights. Below, we’ve curated a complete guide to all of the best state parks in North Georgia. Access our free North Georgia Vacation Guide for a longer list of hand-picked activities and attractions! What Are the Best State Parks in North Georgia? Did you know that some of the most popular parks in the state are located right here in North Georgia? If you’re thinking about planning a fun outdoor activity or two but don’t know where to start, we’ve got you covered. From hiking in North Georgia to kayaking and rafting, there are so many ways to explore North Georgia’s beautiful state parks. Here are our favorite places to explore! 1 What Are the Best State Parks in North Georgia? 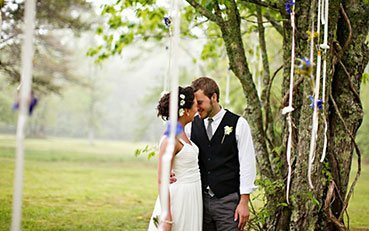 2 Glen-Ella Springs Inn Is Near the Best State Parks in Georgia! 2.0.1 Ready for an unforgettable trip to gorgeous North Georgia? Book our Discover the Falls Package today and we’ll help you make the most of your visit to North Georgia parks! It includes dinner for two in our restaurant, two complimentary hiking sticks, a hand-selected picnic lunch packed in a keepsake backpack, two aluminum water bottles, and trail information. Named after its 1,000-foot deep gorge, Tallulah Gorge State Park is home to one of the most spectacular canyons in the eastern U.S. and features spectacular hiking trails. The gorge serves as a diverse habitat that is home to rare species like the monkey-faced orchid and green salamander. The park also provides incredible views of waterfalls and activities like rock climbing, kayaking, and mountain biking. This popular destination also hosts unique events throughout the year in its dynamic Interpretive Center! Nestled in the heart of the mountains, Glen-Ella Springs Inn is just a short fifteen-minute drive from one of the most breathtaking areas in the state and is the perfect place to retreat after a day of adventure. 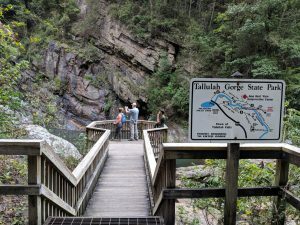 Here are some of our favorite ways to explore the Tallulah Gorge State Park. Tallulah is one of the only state parks in Georgia that has a free archery range for guests to enjoy. Feel free to bring your own gear instead of renting and practice your aim out in the wilderness for a day of priceless fun. More than 20 miles of trails of varying difficulty can be found throughout Tallulah State Park. The easiest is the Shortline Trail, a paved path that is accessible for strollers, bicycles, roller blades, and more. For more advanced mountaineers, head to the North and South Rim Trails and challenge yourself to a tougher trek. Just be sure to wear appropriate clothing for the time of year. This activity merges nature with technology and creates a fun-filled adventure for guests. Using a handheld GPS system, you can participate in a treasure hunt right in the park. Just look for a small gift that a previous park-goer has left behind, and in return, leave something for the next family. Each time you find a treasure, be sure to sign the virtual logbook to share your experience. In the summertime, guests can enjoy a captivating night hike to see the park under the stars. This mile-long walk takes you down the stairs, across the suspension bridge, and along the rim of the gorge, lit by the glow of the moon. Don’t forget to bring your camera! For another relaxing night time activity, you can enjoy a leisurely paddle around Tallulah Lake as the full moon reflects off the water. This ranger-led event is an exciting way to get out in the evenings and enjoy nature. In the month of May, guests can explore the stunning gorge firsthand with a ranger-led gorge floor hike. First you’ll travel down 535 steps to a river crossing, then climb boulders and logs to get to Sliding Rock. Feel free to wear your swimsuit and cool off in the natural slide. Moccasin Creek State Park is an adventure-oriented park located on the shores of Lake Burton. Each season here brings with it an exciting outdoor activity for guests to enjoy! You can try skiing, hiking, boating, and fishing in this park. Since the park is relatively flat, it’s the perfect place to relax and take in the stunning North Georgia scenery. Kids will love exploring the nature trail, and more experienced hikers will be excited to try the slippery Hemlock Falls Trail. Autumn is a particularly beautiful time of year in Moccasin Creek State Park, so be prepared for a crowd! Moccasin Creek State Park was established in 1963 as a basic campground. Since then, it has become an expansive recreation area. Located along the western shore of Lake Burton, the park occupies 32 acres of beautiful land. It has evolved over time to be very family- and handicap-friendly! There are facilities such as picnic shelters, a boat dock, a playground, a wheelchair-accessible fishing pier, and much more. Moccasin Creek State Park also offers access to the Appalachian Trail and Chattahoochee National Forest! Though the park is relatively small, there is plenty to do to keep outdoor lovers engaged and entertained! Fishing from the stream is allowed for children under 11 and adults 65 and older, and visitors of all ages are allowed to fish from the lake. Those who cast a line may catch bass, bream or crappie. Canoeing and kayaking are also popular on the lake, and rentals are available seasonally. Hikers can take the 2-mile Hemlock Falls trail or the 1-mile Interpretive Trail with Wildlife Observation Tower. Children love the onsite playground, and annual events such as Moonshine Madness and Bluegrass in the Park also draw plenty of visitors. One of North Georgia’s most tucked away treasures is the Buck Shoals State Park. Located just north of the fork in the Chattahoochee River where the Soque River breaks east, you’ll find this nook of forested paradise. Hugged by the ‘Hoochee, the Buck Shoals State Park access is a little off-the-beaten-path, making it a truly uninhabited and wild patch in the North Georgia mountains. In the year 2000, this 582-acre plot of land was purchased by the state to protect it from being developed. For a long time, the state didn’t have the funds to turn into a full state park, which kept it a particularly quiet destination with a few hike-in campsites along the river. 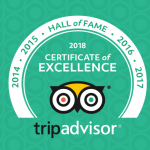 Today, it retains its “hidden gem” quality as one of North Georgia’s best state parks! For those who simply like to breathe the fresh air and behold the mountainous beauty, Buck Shoals is the perfect spot. It’s open throughout the year for special events and there are often guided hiking tours led by a state park naturalist. Fall is typically a busy time for fishing here. This park has a few small lakes that are stocked with bass, bream and catfish. You can even take home whatever you catch! Black Rock Mountain State Park’s claim to fame is its high altitude. It’s the highest public park in the state of Georgia! This park is a must-see for those who want to experience the best of the great outdoors. 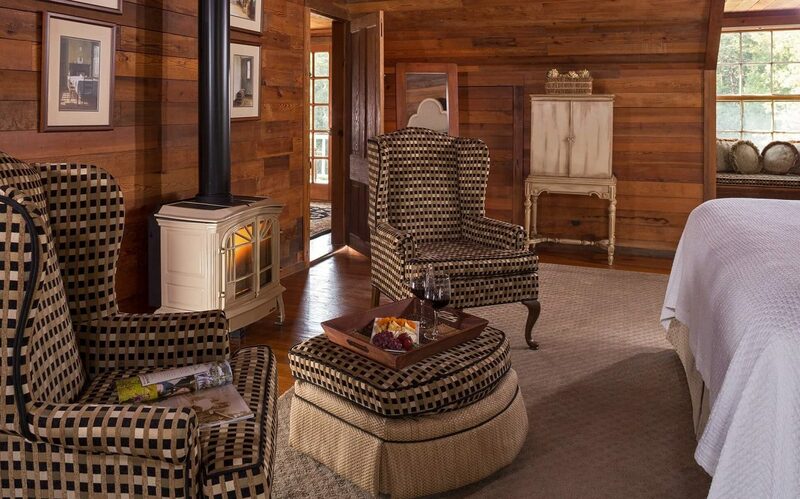 Here, you’ll be met with panoramic views of the Blue Ridge Mountains and almost 1,800 acres of rolling hills. Activities like hiking and North Georgia fishing will bring your inner nature lover to life! The park’s four scenic overlooks provide the perfect photo opportunity for visitors, too! 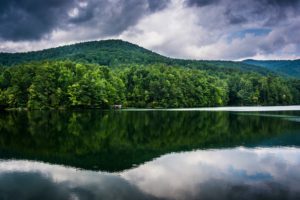 Tucked away in the beloved Black Rock Mountain State Park in Rabun County, GA, Black Rock Lake is a small, 17-acre body of water that can be used for fishing and boating. There are also several walking trails surrounding it to provide stunning views of the surrounding area. This park also contains waterfalls, streams, picnic areas, wildflowers, and much more! It’s one of the best lakes in North Georgia. 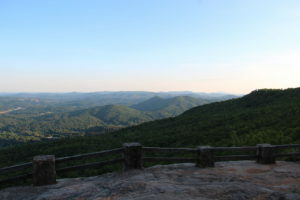 Located in beautiful Blairsville, Georgia, Vogel State Park features some of the best mountain views in the region. This park is one of the oldest in the state of Georgia and shares a timeless connection to the Civilian Conservation Corps. This park is especially popular in fall! There are a variety of trails you can take up to the peak of Blood Mountain! You can choose to start at the Byron Reece Trailhead near Neels Gap; this journey is filled with scenic sights of wildflowers and creeks. The Byron Reece Trail connects with the Appalachian Trail after 0.7 miles and continues up to the peak to reach a total of 4.3 miles round-trip. You lose and gain about 3,000 feet along this course, so be sure to plan for a challenging excursion! There’s also a trail that begins in Vogel State Park and continues up to Blood Mountain. This is an 8.5-mile round-trip course that also contains outstanding sights and overlooks. The Blood Mountain Loop is another favorite that totals 6 miles and is considered moderate to difficult. Each year in June, Vogel State Park gives children the chance to catch a big one with their annual Kids’ Fishing Rodeo, where anglers 12 and under can enjoy a day of trout fishing on Wolf Creek. Or, bring the family to the park on the 4th of July and celebrate our nation’s independence with a flag-raising ceremony, bicycle parade, and tons of fun games. If you plan on visiting North Georgia in the winter, the annual Christmas Tree Lighting Festival is held each December and features hayrides, caroling, bonfires, and even a visit from Santa Claus. There’s always something going on at the park! Vogel State Park’s sprawling 22-acre lake is an ideal destination in the summer. On Lake Trahlyta, visitors can spend an afternoon fishing for bass, bream, and trout, or rent kayaks, stand-up paddleboards, and pedal boats. The lake also has a swimming beach that features breathtaking views, so you can relax and enjoy the surrounding valleys, ridges, and peaks of the Blue Ridge Mountains. North Georgia is considered by many to be a mecca for beautiful waterfalls. 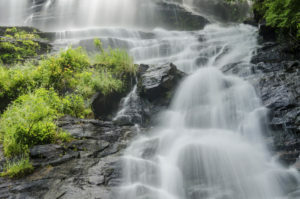 The tallest natural cascade in the Southeast is none other than Amicalola Falls, just under an hour and a half away from Glen-Ella Springs Inn. 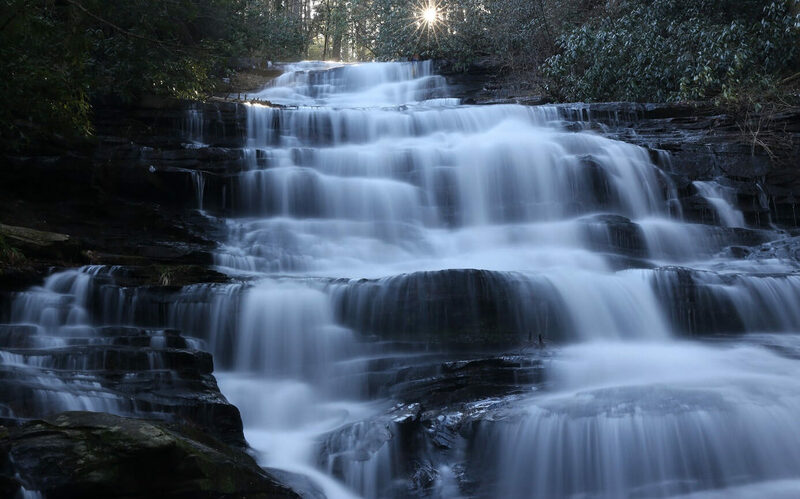 It’s no surprise that visitors flock to Amicalola Falls State Park from all over to see this 729-foot wonder! Below, we’ve compiled all of the best ways to experience this natural wonder. With well over 12 miles of trails scattered throughout the park, hiking is the main attraction at Amicalola Falls. For visitors with limited mobility, or for those who just want the best views of the waterfall, the 0.3-mile West Ridge Falls Access Trail is the best choice. The other nine paths at Amicalola Falls State Park range in length and difficulty, so there’s something for everyone to enjoy! This is one of four Georgia state parks that participate in the Canyon Climbers Club. Ambitious hikers can stop in at the Amicalola Falls park office and purchase a $10 membership card. Card in hand, club members then complete the Canyon Climber Challenge at each participating state park. At Amicalola Falls, this challenge is a steep climb more than 600 steps up the mountain. The path begins at the base of the waterfall and follows the water’s edge straight up the mountain until it reaches the top. Like most Georgia state parks, Amicalola Falls is the perfect place to indulge in a picnic lunch! Before you set out for a day at the park, be sure to pack a lunch to enjoy during your visit. With covered picnic tables and plenty of bench seating, there are a number of great places to pause for a break. Fishing for trout at the base of Amicalola Falls is another great activity to enjoy here. The on-site stream is brimming with trout, which makes for an angler’s paradise. If you’d like to rent fishing gear for the day, be sure to make a pit stop at the park office! Another fun activity to try at this state park is geocaching. This popular activity combines new technology (a smartphone) with the old-fashioned thrill of hunting for treasure. You’ll never forget spending the day discovering hidden caches all over the park. You never know what you might find! Featuring 12 miles of picturesque trails, Unicoi is ideal for hikers and mountain bikers of all skill levels. Throughout the warmer months, the trails are lined with colorful blooms and buds, and the fall brings bursts of red, yellow, and orange leaves. Hikers can even enjoy a journey in the winter, with scenic views of snow-capped mountains. Be sure to bring some water, wear appropriate footwear, and pick up a trail map at the front desk of the Unicoi State Park lodge before heading out. Another popular park attraction is Smith Lake (also known as Unicoi Lake), a cool and refreshing body of water that offers a swimming, canoe and pedal boat rentals, and a sandy beach for sunbathing during the summer. Licensed anglers can cast a line off one of the lake’s docks and catch catfish, bluegill, bass, and a variety of trout. Picnic tables and restrooms are also available. Anna Ruby Falls is reached by way of the Anna Ruby Falls Trail, an easy, half-mile long paved path that is dog-friendly, wheelchair-friendly, and stroller-friendly, so it can be accessed by all! After crossing a bridge over a creek, this trail concludes with two viewing decks of the twin falls, an ideal place for snapping pictures or simply watching the cascading waters. You can also reach these falls through a more adventurous path; the Smith Creek Trail winds from Unicoi State Park to the base of Anna Ruby Falls and is about 4.6 miles in length. Another highlight on the Anna Ruby Falls trail map is the Lion’s Eye Trail, a course designed for the visually impaired; it has rails and Braille signs so even those with little or no eyesight can explore this area. Throughout the year, the park staff hosts a variety of exciting programs and events from craft festivals and concerts to educational hikes and tours. Be sure to check out the Visiting Artist Series in the summer, the Fall Festival every October, and a fireside Arts & Crafts Show each February. With so much to do and see, guests can enjoy visiting the park all year long! Located at 61 Tsalaki Trail in Helen, this state park in North Georgia is known for its incredible catch-and-release trout fishing. Smithgall Woods is where the serious fishermen (and women) congregate! Fishing reservations are recommended due to the high demand and capped number of permitted anglers per day at this site. At 1763 Tugaloo State Park Road in Lavonia, you’ll discover a hidden gem. Nestled on a peninsula on Lake Hartwell, Tugaloo State Park truly caters to anglers and boaters. The lake covers more than 55,000 acres and is a refreshing and beautiful getaway! Found at 1105 Bryant Park Road in Royston, this gorgeous park is home to the Highland Walk Golf Course. Filled with wildlife, bubbling brooks, and shaded thickets, Victoria Bryant State Park is just another fine example of all that the North Georgia State Parks have to offer. 5000 North Browning Bridge Road (in Gainesville) is the address of Don Carter State Park. Located on Lake Lanier, this is yet another opportunity for nature lovers to revel in North Georgia’s incredible beauty. Regardless of whether one is on shore or in a boat, there is plenty of fun to be had here! At 650 Watson Mill Road in Corner, you’ll find the longest covered bridge in the state of Georgia! Watson Mill Bridge State Park is a quiet haven perfect for picnics, light hiking, and horseback riding. Located between Atlanta and Athens at 210 S. Broad Street (in the town of Winder), this popular park features a 1792 log fort built by settlers for protection against Creek and Cherokee Indians. Beyond its history, Fort Yargo offers beautiful scenery, disc golf, swimming, and more! 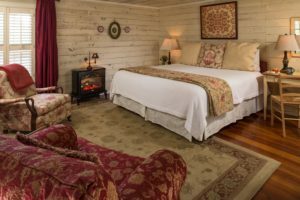 Glen-Ella Springs Inn Is Near the Best State Parks in Georgia! Now that you know about some of the best state parks in Georgia, it’s time to book your trip to the mountains! When planning your excursion, be sure to book a beautiful guest room at Glen-Ella Springs Inn. Our comfortable accommodations are the perfect place to rest your head after a fun day exploring our unique landscape. 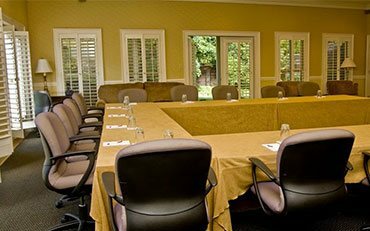 In addition, we offer premium amenities like a delicious complimentary breakfast for guests! Our signature dishes like blueberry pancakes and two-cheese strata will have you feeling awake, refreshed, and ready to take on the day. 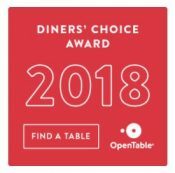 Our on-site restaurant also serves award-winning plates inspired by traditional Southern cuisine! Ready for an unforgettable trip to gorgeous North Georgia? Book our Discover the Falls Package today and we’ll help you make the most of your visit to North Georgia parks! 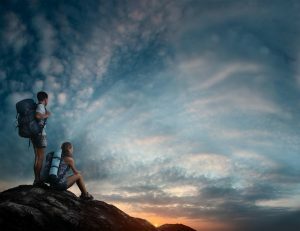 It includes dinner for two in our restaurant, two complimentary hiking sticks, a hand-selected picnic lunch packed in a keepsake backpack, two aluminum water bottles, and trail information. Where Is the Best GA State Park?